The DogSmith Tricks & Manners class lets your dog exercise and learn new skills in a fun and exciting way. Your dog will have a ball, become more confident and burn lots of mental and physical energy. Great for mind and body! You don’t want to miss this opportunity to learn, play and have a great time with your dog! 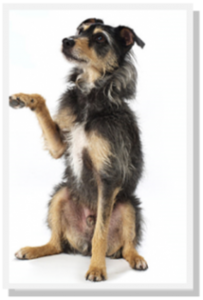 Calling All Hams: Just for Fun Clicks 4 Tricks If your dog is a natural performer and you like dazzling your friends and family with amazing tricks like spin, play dead, high-five, and take a bow, then our Clicks-4-Tricks course is for you. This fast moving and fun clicker-based class is for owners who want to develop new tricks and behaviors with their dogs. We teach you the skills you need to clicker-train your dog so the sky is the limit in terms of what you can teach your dog to do. You can also elect to test for the AKC Novice Trick Dog Title and when your dog passes the test, the DogSmith AKC evaluator will give you the official documentation to send to the AKC for your certificate and to register your dog’s accomplishment. Sign-up today and get started. Calling All Hams: Just for Fun Clicks-4-Tricks II If your dog is a natural performer and you like dazzling your friends and family with complicated tricks, then our Clicks-4-Tricks II course is for you. This fast moving and fun clicker-based class builds on tricks and skills learned in the Clicks-4-Tricks class to develop new tricks and behaviors with their dogs through free-shaping. You can also elect to test for the AKC Intermediate Trick Dog Title and when your dog passes the test, the DogSmith AKC evaluator will give you the official documentation to send to the AKC for your certificate and to register your dog’s accomplishment. Sign-up today and get started. Calling All Hams: Just for Fun Clicks-4-Tricks III If your dog is a natural performer and you like dazzling your friends and family with complicated tricks, then our Clicks-4-Tricks III course is for you. This fast moving and fun clicker-based class builds on tricks and skills learned in the Clicks-4-Tricks II class to develop new tricks and behaviors with their dogs through free-shaping, back-chaining cues and sequencing knows behaviors into compound behaviors. You can also elect to test for the AKC Advanced Trick Dog Title and when your dog passes the test, the DogSmith AKC evaluator will give you the official documentation to send to the AKC for your certificate and to register your dog’s accomplishment. Sign-up today and get started. Calling All Hams! Just for Fun Clicks-4-Tricks IV If your dog is a natural performer and you are thinking about performing in other dog sports like freestyle, then our Clicks-4-Tricks IV course is for you. This fast moving and fun clicker-based class builds on tricks and skills learned in the Clicks-4-Tricks class to develop new tricks and behaviors with their dogs through free-shaping, back-chaining, sequencing and videotaped review to create a choreographed performance. You can also elect to test for the AKC Performer Trick Dog Title and when your dog passes the test, the DogSmith AKC evaluator will give you the official documentation to send to the AKC for your certificate and to register your dog’s accomplishment. Sign-up today and get started. DogSmith “Tricks & Manners” This 6-week class meets for one hour a week. All behaviours are taught as tricks, so whether teaching a sit, a down or a spin, you are guaranteed to have a great time! You will learn lots of useful techniques for teaching your canine companion the many skills they need to be a well-mannered member of your family, as well as lots of fun ‘party tricks’ to impress your friends.